Once again, we will look at the OHL over this past week and see who has been good, who has been bad and have the Barrie Colts finally ended their losing streak? The Erie Otters are the best in the west. Correction, the Erie Otters are the best in the league. They extended their winning streak to 10 games this week with a pair of wins. Erie started things off with a dominant 9-4 win over the Saginaw Spirit. Joseph Murdaca got the start for the Otters and didn’t look good early, allowing 3 goals on the first 9 shots. He would tighten things up over the next two periods stopping 22 of 26 shots faced. Taylor Raddysh was named the 1st star of the game scoring a pair of goals and adding two assists. Alex DeBrincat also had a 4 point night for Erie posting a goal and 3 helpers, while Kyle Maksimovich would add 4 assists. Dylan Strome got the game winner and an assist in the win. Erie out shot Saginaw 43-26 in a dominant performance – despite a Morrison inability to score on the powerplay. Their next game was Sunday Night when they hosted the Windsor who came into Erie riding a 5 game winning streak. Flint came out hard scoring the first goal of the game in the first minute but Erie would score the next 3 to take a 3-1 lead. Taylor Raddysh scored first with his 26th of the year. Red Wings prospect Jordan Sambrook added his 8th and 9th of the season just past the halfway mark of the 2nd period. Saginaw would respond with a pair of goals over the second half of regulation to force OT. Ultimately the game would need a shootout to decide a winner – Dylan Strome and Ivan Lodnia would get goals in the shootout to give the Otters the 4-3 victory. Taylor Raddysh scored 3 goals and had 3 assists over the weekend putting him in 2nd league wide for points, while Alex DeBrincat posted 5 points to extend his lead in the top spot with 97 points this year. The team is riding a 10 game winning streak and have already clinched a playoff spot. The Owen Sound Attack continue to roll winning all 3 games this past week extending their win streak to 4 games. They have only lost 2 games in the last 10 with one of them coming in a shootout. They outscored their opponents this week 20-7 with wins over Hamilton, Kingston and a 10 goal performance against Ottawa. Hamilton didn’t make things easy for Owen Sound but they couldn’t find a way to beat Michael McNiven. The Bulldogs outshot the Attack 31-20 but strong goaltending and a successful power play made the difference in the 5-2 win. Santino Centorame got the game winner late in the 2nd period and added an assist on the night. Petrus Palmu also scored a goal and added a pair of assists on the night. Emanuel Vella got the start for Owen Sound against Ottawa and had a rough night making 14 saves on only 19 shots. Luckily for him, Ottawa didn’t get better goaltending and his team put up 10 goals. Jonah Gadjovich scored three goals, while Markus Phillips added three assists. Rookie Aidan Dudas also put up three points scoring a goal and two assists. Centorame (2A), Matthew Struthers (2G), Kevin Hancock (1G, 1A), Chase Campbell (2G), Matt Schmalz (1G,1A)and Nick Suzuki (2A) all contributed with a pair of points each. After a tough night in goal, the Attack went back to Michael McNiven to close out the week. Not really shocking. He would get fourth shutout of the season on 26 saves in a 5-0 win over Kingston. Nick Suzuki was a monster scoring three goals on nine shots. Santino Centorame earned another assist putting him in fifth place league wide for assists with 47. The Attack are now just 5 points behind London in the standings. If Erie is the Best in the West, then right now the Mississauga Steelheads are the ‘Beast in the East’. They did drop a game in the Shootout to Hamilton this week 4-3, but managed to get a 7-5 win over Barrie and finished the week with a 3-2 win over Saginaw. Sure, they are in a VERY WEAK Central division but that doesn’t take away from the fact this team is rolling right now. Riding a 7-1-1-1 record over their last 10 games, the team is the only one with a positive goal differential this season in the Central Division. The team currently has 60 points and is third in the Eastern Conference, trailing Oshawa and Peterborough who currently are tied for first with 69 points. The Flint Firebirds have been on a hot streak – the team is riding a 5-0-0-1 record in their past six games, with wins this week over the Soo and Guelph. The only game they have lost was a 4-3 SO loss to London. The team currently sits in 7th place in the West. Barrie Colts rode an impressive 1 game win streak this week! Yes, this is a bit of a troll, but the team was on a huge losing streak that ended at 9 games. The teams win came against Niagara this week in an 11 round shootout. Christian Propp was outstanding in the Colts win. They have gone back to losing so, it is business as usual again in Barrie. Barrie only has 14 wins this season. 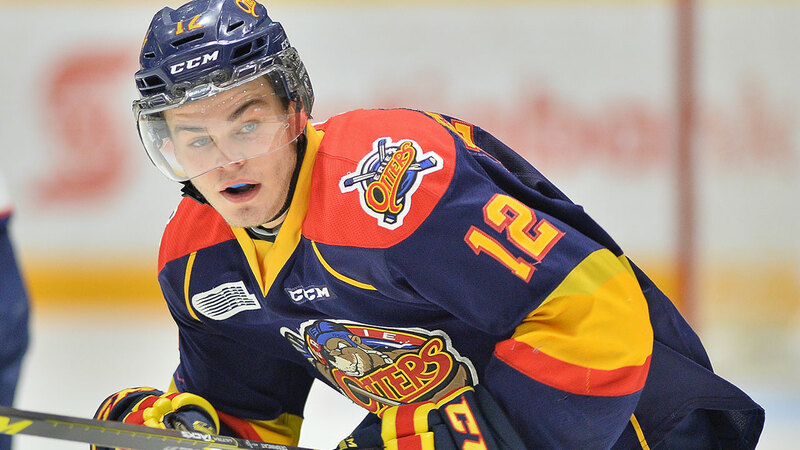 After not being drafted by an OHL team, Alex DeBrincat is nearing history with the Erie Otters. Over the weekend, the skilled forward passed 300 career regular season points. More notably, he is now only four goals shy of scoring 50 for the third straight season – something that has never been accomplished in the OHL. He’s been overlooked his whole career – by the OHL, the NHL and even USA Hockey – because of his size, but the simple fact is that the kid can score. Next season, he’ll look to prove he can keep it up at the next level – but one thing is for certain, it’s probably about time people stop betting against Alex DeBrincat. Though we haven’t seen final numbers yet, the Kingston Frontenacs Tragically Hip jersey auction to raise money for brain cancer research ended this weekend. Headed into the final 24 hours of the auction, the team had seen over 800 bids totaling over $37,000. Outstanding! Kingston, you the real hero! We will update with a final number once we see something official. Thank you to all of those who helped out and congrats to those who won a jersey. They are beauts! So many errors regarding the Erie Otters game Sunday. It was against Windsor Spitfires, not Flint or Saginaw that were both mentioned in the paragraph. The shootout had 2 goals from Dylan Strome and Ivan Lodnia with final score of 5-4. Good eye. When putting these together errors are not new for me some mornings. Thanks for pointing these errors out and thanks for reading. I will try to have less mistakes next week.